Travelling to see far-away family members is common during the holiday season. Keep the festive travel season safe with these guiding tips. Families who have seen the classic 1989 movie, National Lampoon’s Christmas Vacation, will be able to carry a tune off this brief song lyric. Travelling to see remote family members is a common theme during the holiday season. Movies like Christmas Vacation illustrate the joy, relaxation, and also anxiety that this travel can cause. Here are a few tips for you to prepare your vehicle for a safe and relaxing trip to see family members – wherever they may be! 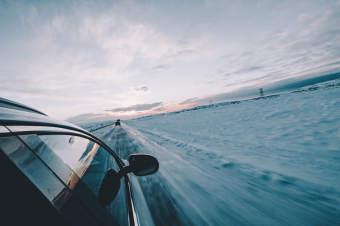 Dropping temperatures mean that snow and ice threaten our vehicle’s traction, handling, and breaking. Install four winter tires on your vehicle to protect your family during poor driving conditions. According to the Ministry of Transportation of Ontario, winter tires on your vehicle can shorten braking distances by as much as 25 percent. It is not recommended that you mix different types of tires on one vehicle. Cold weather also alters your tire pressure. Be sure to check your tire pressure often and ensure that your tires are not worn or damaged. Experiencing a vehicle breakdown while on the road can be stressful and frightening. Make sure that you are prepared to stay calm in an emergency by keeping basic supplies in your vehicle. Keep your vehicle serviced regularly as a preventative measure. You should also perform a maintenance check before longer trips. Before leaving the driveway, make sure that you have washer fluid in your vehicle that works down to -40 degrees Celsius. Slow down on icy and slippery roads. It is important that you leave extra space around you and other vehicles, even with winter tires installed on your car. Poor visibility can also impact driving conditions. Be sure to use your vehicle’s full lighting system. Pack an ice-scraper in your vehicle so that you can maintain clear visibility. In more extreme winter driving conditions, such as whiteouts, do not attempt to drive. Alter your travel plans on the side of safety. You may be able to enjoy an extra glass of eggnog with family as a result! Our coverage will make you feel safe every time you hit the road.